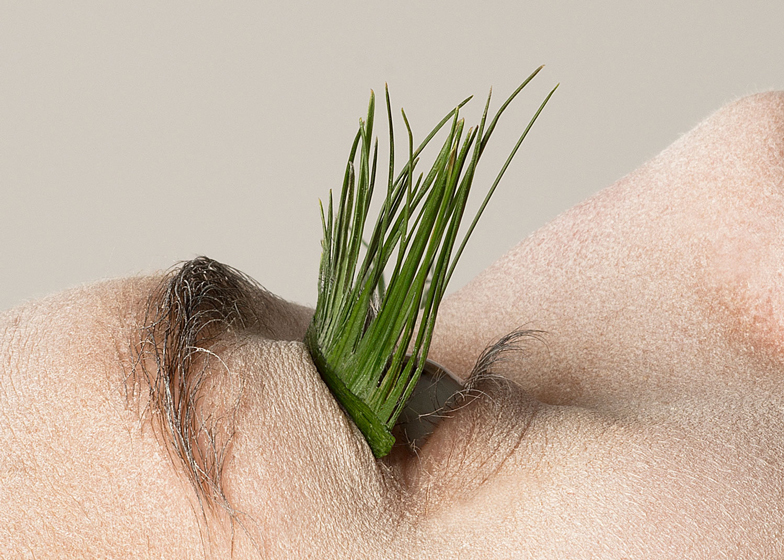 Graduate shows 2015: grass blades and pine needles were used to make these entirely natural false eyelashes by Kingston University graduate Mary Graham. Graham turned the foliage into sets of eyelashes to highlight the falsities of cosmetics that are labelled as "natural" – which she claims often don't contain many naturally sourced ingredients. To make the Natural lashes, she picked up grass and needles of evergreen trees from the ground at her local park and in her garden. The strands of plants were stuck together with a natural glue made from eggs and snow, which was also used to attach the lashes to the eyelids. As part of her Graphic Design course at London's Kingston University, Graham photographed a model wearing the lashes and printed the images in a magazine to look like a beauty product campaign. Graham pointed out that the only unprocessed ingredient in a "natural" set of lashes made by a well-known UK pharmacy is water, and that the classification of beauty products in this way does not reflect what goes into them. "A product only has to contain one per cent natural elements to be labeled as a natural product," said Graham. "The term 'natural' has never been specified, so often companies who have sourced their products from natural elements label them as natural," she told Dezeen. "However, they conveniently leave out the chemical manipulation that occurs afterwards as the once-natural elements are blasted with artificial properties." The designer believes that the lashes, which last for less than 24 hours before they wilt, could be used for a variety of occasions, from music festivals to couture fashion shows. The project echoes the work of Japanese artist Takaya, who uses raw vegetables and flowers to make decorative headpieces. Aside from the cost of the eggs, Graham's lashes are free to make and she wants to encourage others to create pairs themselves. "With the ever-growing DIY culture infiltrating cosmetics I do believe that these lashes could catch on as a trend," Graham said. "People are now encouraged to go into their gardens and gather plants and mud to make face masks, so why not eyelashes?" She would also like to make a new range when the plants change colour towards the end of the year. "I want to create these lashes again but in the autumn so that I could use beautiful oranges and reds," said Graham. "These lashes have seasons and would appear differently depending on the time of year. Almost like fashion trends, they are always changing and never constant." Graham intends to extend her line to include beauty products for the lips and skin. "I don't want this project to stop at lashes," she said. "I want to create a whole range of natural cosmetics that are convincing enough to be used. I have looked up beetroot recipes for lipstick and sand/chalk mixtures for fake tan. This is only the beginning of my natural venture." False eyelashes unexpectedly made design news in 2013 when London's V&A museum acquired a set of Katy Perry Lashes as part of its rapid-response collecting strategy.